I am so excited to introduce you to CVS's new skin care line called Skin+Pharmacy. It's a full line of skin care products at drugstore prices! When CVS offered me products for review, I was really excited. I live in the middle of nowhere and CVS is one of the few places here that carries makeup, so I really like the convenience of being able to pick up the products when I'm running my weekly errands. CVS generously offered to offer a set for one of my lucky readers, so keep reading for your chance to win a set! This daily cream is make for dry skin. 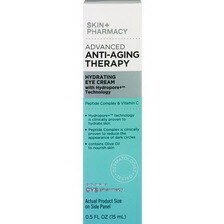 It has Hydropore+ technology to hydrate your skin and apricot kernel oil and hyaluronic acid to moisturize. Olive oil nourishes and protects your skin. Using this cream daily can help diminish the appearance of fine lines. Your delicate eye area needs its own moisturizer. This cream hydrates your skin while it reduces the appearance of dark circles and fine lines. It also has vitamin C, which is a great antioxidant for your skin. 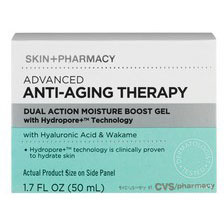 This gel nourishes and hydrates dry skin while it works to reduce the appearance fine lines. 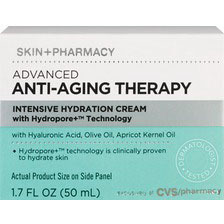 You can use this product alone or with another moisturizer. 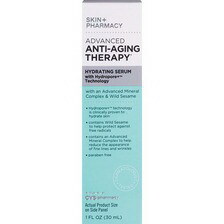 This anti-aging serum should be used after cleansing and toning and before your moisturizer. Do you want to try them for yourself? 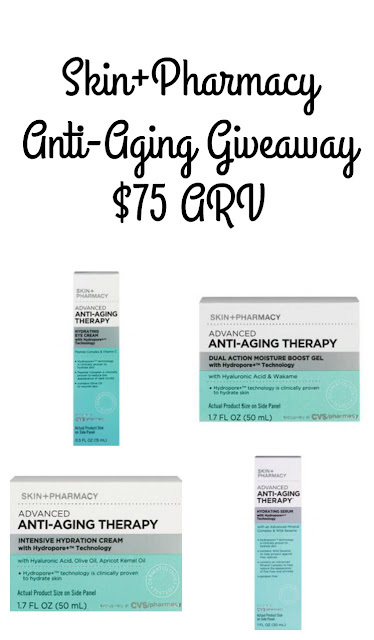 One lucky winner will receive one of each of these products, which is a $75 value! Winner must be 18+ and have a United States shipping address.